The lakes near our lodge have good populations of lake trout and because the water stays so cold, the fish are often shallow, making them accessible to the fly fisherman. 10lb trophies are not uncommon in our area. 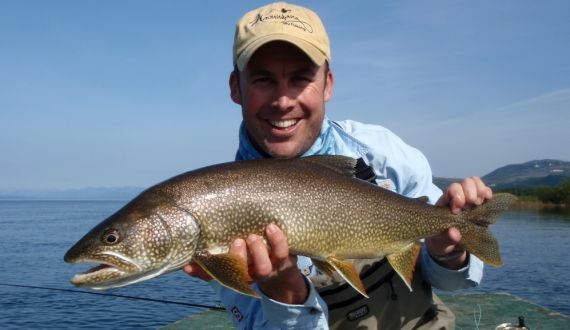 Catching a Lake trout on a fly rod is a very rare occurrence in most places in the world. Normally the lake trout feed very deep in lakes. This makes them impossible to fish with conventional fly-fishing gear. At the Royal Coachman early in the spring these trout feed aggressively on migrating salmon smolt. 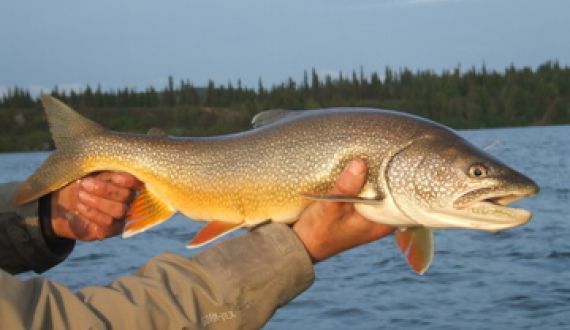 Lucky for us we offer productive lake trout fishing right out front of our lodge. One guest last season caught the biggest Laker of the year 34 inches right in front of the dock. Only minutes after he arriving at the lodge. Traditionally, we fish for lake trout with sinking line and heavy streamers, but not in June and early July when they are caught near the surface with floating lines. Early in the season, Spey rods are a great way to fish for lake trout. If you have a two-handed rod or want to learn how to use one, bring it up to the lodge and our guides would love to teach you the basics of a spey casting. If you’re a patient angler, your hard work will be rewarded early in the season. We have had “Taimen-like“ responses from giant lake trout chasing and even grabbing, already hooked grayling from angler’s lines! Maybe heavy fly gear fishing is not your thing. Well that's O.K. too. We have other fisheries that produce great lake trout fishing also. When conditions are right, you can even temp these fish to eat skated surface flies! Come to our Alaska fishing lodge and enjoy some of the best shallow water (and even creek fishing) Lake Trout fishing in Alaska!